This might be an old news to some of you but being half British, for us in Shewsbury Land this is still an important one and we want it to be appear here in Shewsbury Land. Sir Bobby Robson passed away last month on 31st July 2009 though he have nothing to do with Manchester United and/or FC Tokyo, I believe it is a big loss to the English football industry. Sir Bobby is indeed a very nice man, very friendly and cheerful person - many can confirm that to you for sure. He have his high and low in the football arena and he may not won as many trophy as Sir Alex Ferguson did but till today Sir Bobby is still one of the most respected figure and icon in English football. He truly deserve the UEFA Lifetime Achievement Award and more than that he deserve a true respect from all people in the world of football. He is the man who appreciate every minute in football and every moment in life. Rest In Peace. May God bless his soul. Amen. 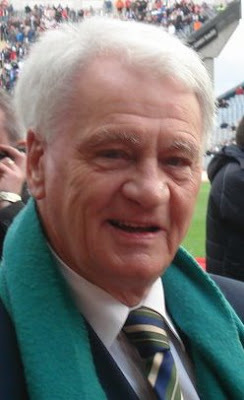 Sir Robert William "Bobby" Robson CBE (18 February 1933 – 31 July 2009) was an English footballer and, after retirement, manager of several European clubs and the England national football team. His professional playing career as an inside-forward spanned nearly 20 years, during which he played for three clubs: Fulham, West Bromwich Albion, and, briefly, Vancouver. He also made 20 appearances for England, scoring four goals. After his playing career he found success as both a club and international manager, winning league championships in both the Netherlands and Portugal, earning trophies in England and Spain, and taking England to the semi-final of the 1990 World Cup. His last management role was as a mentor to the manager of the Irish national football team. Robson was created a Knight Bachelor in 2002, was inducted as a member of the English Football Hall of Fame in 2003, and was the honorary president of Ipswich Town. From 1991 onwards he suffered recurrent medical problems with cancer, and in March 2008, put his name and efforts into the Sir Bobby Robson Foundation, a cancer research charity. In August 2008, his lung cancer was confirmed to be terminal; he said: "My condition is described as static and has not altered since my last bout of chemotherapy...I am going to die sooner rather than later. But then everyone has to go sometime and I have enjoyed every minute". He died just under a year later.